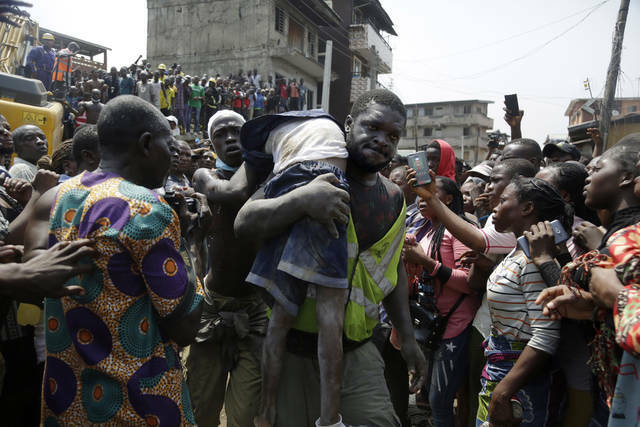 LAGOS, Nigeria (AP) — Twenty people are confirmed dead in the school building that collapsed in Nigeria on Wednesday, and most of them are children, an official said Friday. 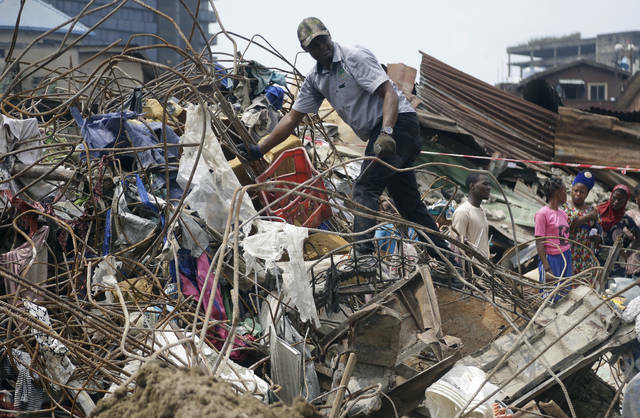 Forty-three other people were rescued, Lagos State Health Commissioner Jide Idris told The Associated Press. The disaster occurred in the heart of Nigeria’s commercial capital. Officials have said the three-story residential building had been marked for demolition and that the school was operating illegally on the top two floors. It is still not clear how many people were inside when it collapsed. Rescue crews halted their search on Thursday, saying they had reached the building’s foundation without finding any other victims. Some anguished families protested and sifted through the rubble for any sign of their children. Building collapses are all too common in the West African nation, where new construction often goes up without regulatory oversight. Official moved through the neighborhood on Thursday, marking other derelict buildings for demolition. Adeyemo Sunday, the father of twins, mourned one of his sons. The other was pulled out alive, he said. Sunday said his family lived on the building’s second floor and he sent his boys to school there so they wouldn’t have to travel far. Another parent, Yewande Ogunsanwo, said her son remained in critical condition on Thursday. The collapse came as President Muhammadu Buhari, newly elected to a second term, tries to improve the distressed infrastructure in Africa’s most populous nation. Russian anti-doping agency deputy CEO Margarita Pakhnotskaya told The Associated Press on Friday there were “tens” of cases in the sport of powerlifting. The agency is now investigating whether the inspectors worked in other sports and tipped off athletes in those events too. Pakhnotskaya was speaking hours after the International Paralympic Committee lifted its doping suspension of Russia , subject to extra drug-testing in future. There’s no evidence Russian Paralympians received any tipoffs. “They know they’re breaking the rules,” she said. One giveaway that the tests weren’t above-board, Pakhnotskaya said, were forms claiming male inspectors had witnessed female athletes give urine samples — a clear breach of the rules. WADA lifted RUSADA’s suspension last year on the condition that Russian authorities turn over computer data and drug-test samples which could reveal more past doping offenses. Otherwise “people will think nothing’s changed” in Russian sport, she said, adding “we’re grateful to the athletes who informed us” of the alleged tipoffs. Disclosure statement: Bob Spires is affiliated with Love Without Boundaries, an international nonprofit serving disadvantaged children in China, Cambodia, India and Uganda. He has collaborated with Liberty Shared, an international nonprofit anti-trafficking and advocacy organization. Partners: University of Richmond provides funding as a member of The Conversation US. To be sure, Trump has signed several important laws, including one that designates US $430 million to fight trafficking. The White House continues, however, to pressure legislators to tie stronger border security to human trafficking, which distracts from the real issue of the exploitation of migrants. Peter Mulholland: Florida pretending to go after Human trafficking while surveilling massage parlor for months is funny, if not sad. Following suspects from site and getting their licences under false traffic stops , pretending to care about the women for months? Who believes this? Florida runs 80% of their states budget from corrections. Illegals have no money, so lets watch these woman get abused for months, then pretend we care about the victims. Disclosure statement: Thomas Adam does not work for, consult, own shares in or receive funding from any company or organization that would benefit from this article, and has disclosed no relevant affiliations beyond their academic appointment. Vietnam seemed like the perfect place for Donald Trump and North Korean dictator Kim Jong Un to meet in late February for their latest summit on denuclearization. At Hanoi’s posh Metropole Hotel, Trump hoped to convince Kim to abandon nuclear weapons in exchange for lifting U.S. sanctions against North Korea, which would spur needed economic development in that country. North Korea’s economy has been in dire straits since the Soviet Union – which had propped up its communist regime – collapsed in the early 1990s. Starvation remains common in North Korea, where 10.5 of its 25 million people are undernourished. Meanwhile, Vietnam – once one of the world’s poorest countries – has prospered. Its communist government introduced free-market reforms in the late 1980s after the failure of its Soviet-style planned economy, permitting the private ownership of businesses and farms after years of controlling all markets. Referencing Vietnam’s economic success story, President Trump wrote on Twitter on February 8: “With complete Denuclearization, North Korea will rapidly become an Economic Powerhouse” too. As a historian, I disagree with Trump’s view that Vietnam is the blueprint for North Korea. I am currently writing a college textbook on the history of Germany, my country of birth. The Vietnam summit came while I was focused on the chapter about East Germany’s transition, in the 1990s, from a Soviet-style socialist economy to a more free-market economy. In my assessment, North Korea is much more similar to Cold War-era East Germany than it is to modern Vietnam. Both North Korea and East Germany were separated by communism from the other half of their once-unified nation. They are countries founded entirely on the rejection of their capitalist brothers. The Korean peninsula has been split in two since 1945, when Soviet and American troops liberated it from Japan at the end of World War II. The Allies divided the peninsula along the 38th parallel, with the Soviets occupying the North and the Americans occupying the South. This split deepened in June 1950, when the communist North tried to unify the country under its rule, invading the South. Korea’s civil war turned into a proxy Cold War as communist China aided North Korea and the U.S. sent troops to defend the South Koreans. A 1953 armistice has divided the Korean peninsula ever since. Like Korea, Germany was also split into two competing states. Capitalist West Germany and communist East Germany existed side by side, divided by the Berlin Wall, from 1945 to 1990. Initially, East Germany’s centralized, planned economy was quite successful in rebuilding the country after the war. But by the mid-1960s, economic growth had slowed, resulting in a shortage of consumer and industrial products. To reinvigorate the economy, East German leader Walter Ulbricht began relaxing the government’s grip on the economy. Managers of state-run enterprises were given decision-making power over what goods to produce, a role previously retained by the government, and allowed to keep some of their profits. Banks got permission to extend loans to the businesses of their choice, helping them grow and invest. Even though productivity, wages and availability of consumer goods all increased, East Germany abruptly abandoned these reforms in the early 1970s. It was not because they did not work. Rather, according to my research and the historian Joerg Roesler, East Germany began to fear that its liberal economy was starting to make it look dangerously similar to West Germany. In 1968, the Soviets had invaded neighboring Czechoslovakia, terminating its experimentation with both economic and political liberalization. The East German government worried that its economy had become a little too liberal, too. East Germany’s attempt to preserve communist rule by maintaining authority over its faltering economy proved futile. On Oct. 3, 1990, Germany was reunified under West German control. The economy has always been at the heart of communism. A planned economy is what set countries like the Soviet Union, Cuba, and Vietnam apart from capitalist democracies. For communist leaders like Vladimir Lenin and Fidel Castro, it’s what made them superior. Plenty of communist governments have managed to mix some free-market capitalism into their socialist economies without endangering the Communist Party’s monopoly on power – Vietnam, Cuba and China top among them. The transition toward capitalism in those countries has come at the cost of social inequalities. Freer markets have created a growing class of wealthy entrepreneurs, while some more marginal populations have remained excluded from these new riches. Still, vastly improved living conditions have actually boosted the legitimacy of communist governments in Vietnam, Cuba and China. East Germany and North Korea differ from these examples. They are halves of a whole. The planned economy doesn’t just inform their political system – it is the sole reason for their existence. East Germany and North Korea were born to offer an economic alternative from their capitalist compatriots. If these countries cease to present a clear economic alternative that distinguishes them from their capitalist brother-country, history shows, they are absorbed by them. My research suggests that denuclearization, the lifting of U.S. sanctions and a transition into market socialism would trigger an East Germany-style existential crisis for North Korea. That’s because a prospering economy would eliminate the very reason for North Korean existence, obviating the rationale for Kim’s totalitarian policies, anti-American rhetoric and isolation. For North Korea’s all-powerful leader, a failing centralized economy and a grip on power that’s guaranteed by the threat of nuclear warfare is better than a vibrant capitalist economy. Kim promised North Koreans better living conditions after succeeding his father, dictator Kim Jong Il, in 2011. But what he really needs are economic reforms that boost the economy without threatening the communist character of North Korea’s economy. No post-Cold War country has managed it yet. Chao, whose agency oversees the FAA, said the audit will improve the department’s decision-making. Her letter confirmed that she had previously requested an audit. It did not mention that the inspector general and federal prosecutors have already started looking into the development and regulatory approval of the jet, as reported by news outlets, including The Associated Press. In his own letter to the inspector general, Blumenthal said the watchdog should examine whether problems with the plane were missed because Boeing employees did some safety-certification work on FAA’s behalf. He also questioned whether the FAA should have done more after the first 737 Max accident, and why the FAA didn’t ground the plane as quickly as other regulators around the world. Questions about the FAA’s handling of the issue extend beyond U.S. borders and will pose an immediate challenge for Dickson if he is confirmed to lead the agency. Dickson was Delta’s senior vice president of flight operations until retiring on Oct. 1 after 27 years with the airline, including time flying the 737 and other Boeing jets. Before that, he was an Air Force pilot. He emerged in recent weeks as the likely choice to lead FAA. Critics have questioned the FAA’s practice of using employees of aircraft manufacturers to handle some safety inspections. FAA inspectors review the work of the manufacturers’ employees, who are on the company payroll and could face a conflict of interest. Other nations banned the Max 8 and a slightly larger model, the Max 9, in the days after the Ethiopian crash. The FAA and U.S. airlines that use the planes stood by the plane’s safety until last week. The plane is an important part of Chicago-based Boeing’s future. The company has taken more than 5,000 orders and delivered more than 250 Max jets last year. Boeing still makes an older version of the popular 737, but it expected the Max to account for 90 percent of all 737 deliveries this year.